With a successful first year as pitch partner of the EVO-STIK Northern Premier League under their belts, sports turf specialist GreenFields was today unveiled as the new official pitch partner for the clubs at the other end of the country, in the EVO-STIK League South. The partnership was announced to the league’s 84 clubs earlier this week in the lead up to the start of the season this coming Saturday. As established already with clubs in the North, GreenFields as a manufacturer and installer of FIFA accredited artificial pitches will provide advice and support on sports surfaces to the 84 clubs in the South. This will help clubs who are looking at creating a business model focused on the increased footfall and usability of having a 3G pitch. GreenFields is also an established pitch maintenance provider with a national Grounds Team, and as a result of this, natural grass advice will also form a big part of the partnership. GreenFields will send out a newsletter every 6 weeks primarily focused on natural grass pitches as part of the drive to reduce the number of fixture postponements during the winter months. 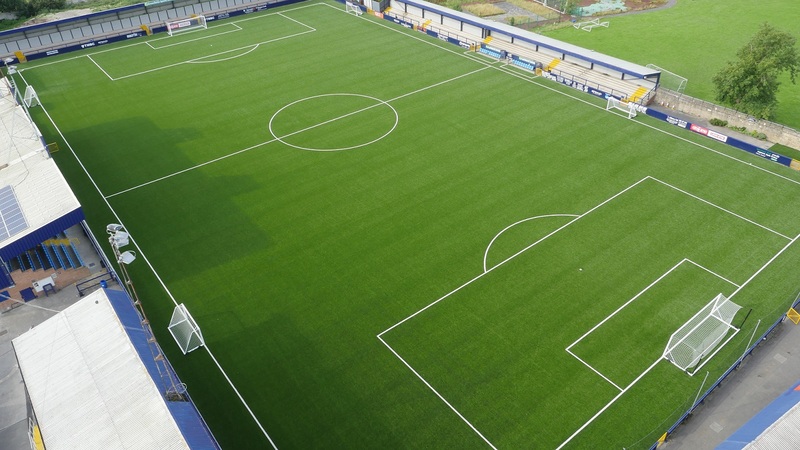 In the EVO-STIK Northern Premier League, GreenFields have successfully installed their 3G woven elite product at Hyde United FC back in 2016 and are in the process of installing the same product at fellow member club, Buxton FC. GreenFields have also recently partnered with funding experts, Sedulo who can offer support and advice to clubs to enable them to secure the right type of funding to suit their needs and to facilitate the installation of a new sports pitch.